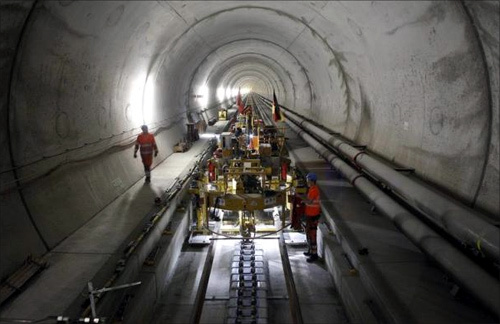 The excavation work to build the world's longest railway tunnel beneath the Swiss Alps is complete. 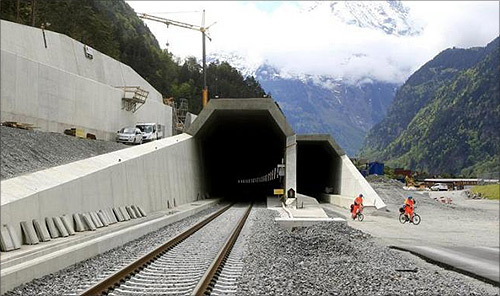 The high-speed rail link in Switzerland, where passenger trains can travel at a maximum speed of up to 250 kilometres per hour, will be operational by 2016. With a route length of 57 km, it surpasses the Seikan Tunnel in Japan. 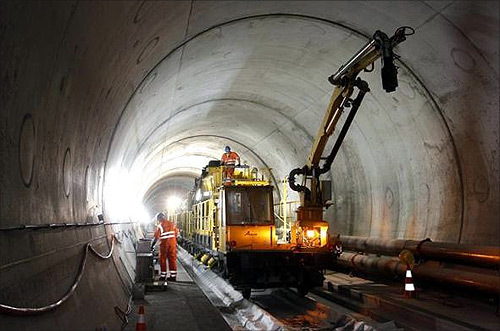 A straight route with no curves or level crossings on the overground sections, the Gotthard and Ceneri Base Tunnels together make the project one of the world's most outstanding engineering marvels. 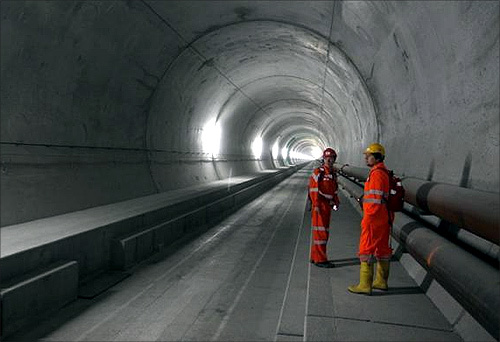 Image: Workers cycle past the northern entrances of the NEAT Gotthard Base tunnel near Erstfeld (May 7, 2012). 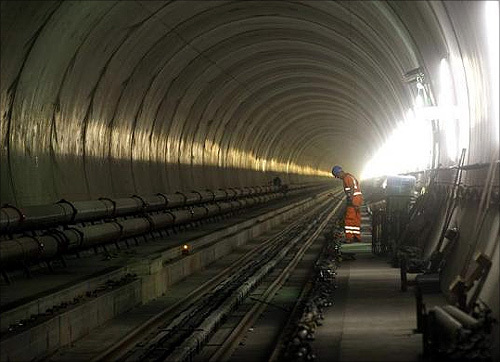 An employee of AlpTransit Gotthard and a visitor stand at the NEAT Gotthard Base tunnel near Erstfeld. 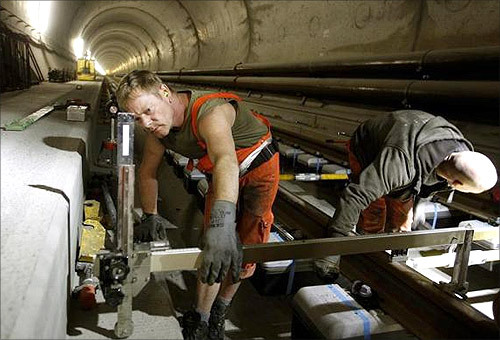 A worker uses a hammer during the installation of the railway tracks in the NEAT Gotthard Base tunnel near Erstfeld. 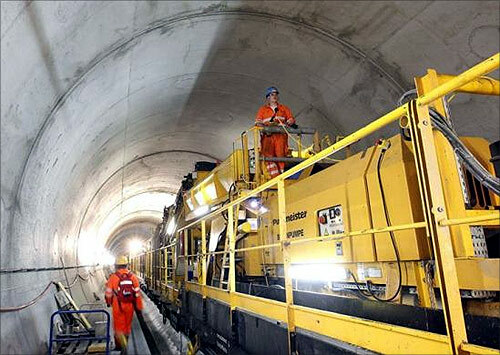 A worker stands beside mobile maschinery during the installation of the railway tracks in the NEAT Gotthard Base tunnel near Erstfeld May 7, 2012. 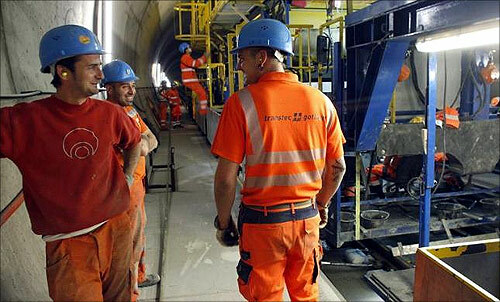 Workers sitting on the special train 'Helvetia' distribute fresh concrete on the track bed of the rails in the NEAT Gotthard Base tunnel near Erstfeld May 7, 2012. 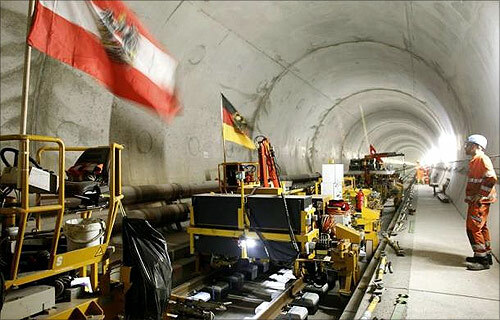 An Austrian and a German national flag fly on mobile machinery during the installation of the railway tracks in the NEAT Gotthard Base tunnel near Erstfeld May 7, 2012. 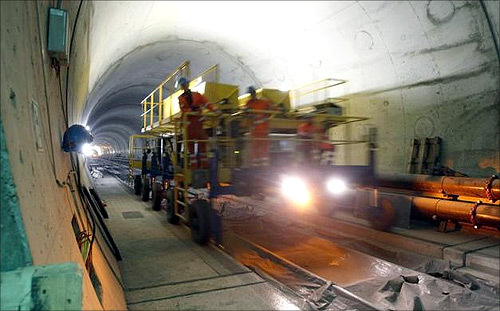 Workers drive on a special vehicle during the installation of the railway tracks in the NEAT Gotthard Base tunnel near Erstfeld May 7, 2012. 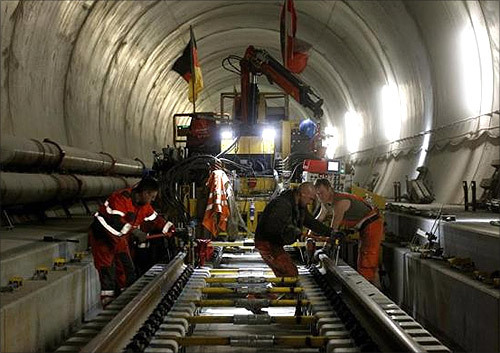 Workers use torque wrenches to fix screw nuts during the installation of the railway tracks in the NEAT Gotthard Base tunnel near Erstfeld. An engineer sits on the special train 'Helvetia' in the NEAT Gotthard Base tunnel near Erstfeld May 7, 2012. 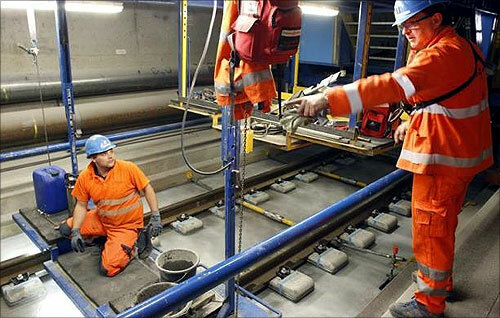 A worker stands on the special train 'Helvetia' in the NEAT Gotthard Base tunnel near Erstfeld May 7, 2012. 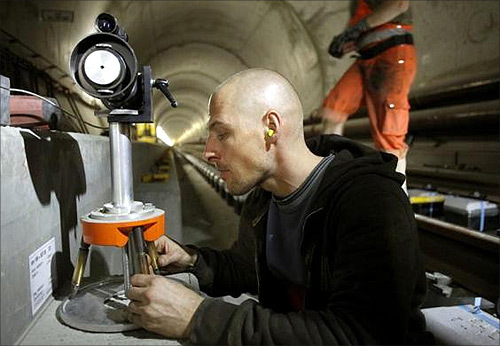 A worker uses a measuring gauge during the installation of the railway tracks in the NEAT Gotthard Base tunnel near Erstfeld. 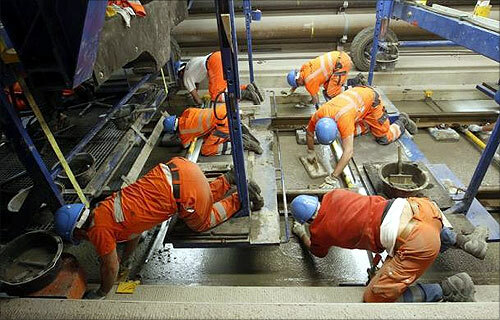 Workers use finishing trowels to plane fresh concrete on the track bed of the rails in the NEAT Gotthard Base tunnel near Erstfeld May 7, 2012. 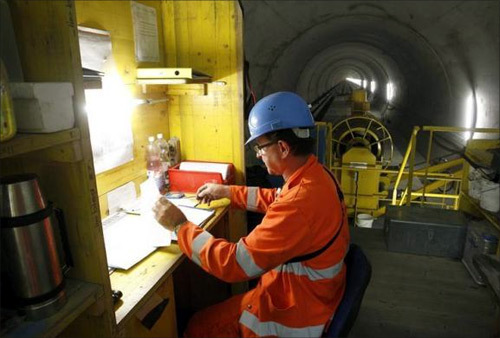 A worker receives instructions from an engineer during the installation of the railway tracks in the NEAT Gotthard Base tunnel near Erstfeld May 7, 2012. 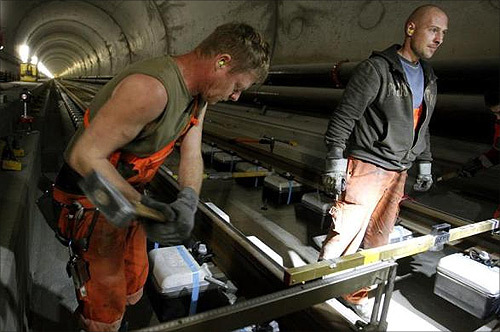 A worker use torque wrench to fix screw nuts during the installation of the railway tracks in the NEAT Gotthard Base tunnel near Erstfeld May 7, 2012. Workers joke during a break beside the special train 'Helvetia' in the NEAT Gotthard Base tunnel near Erstfeld May 7, 2012. 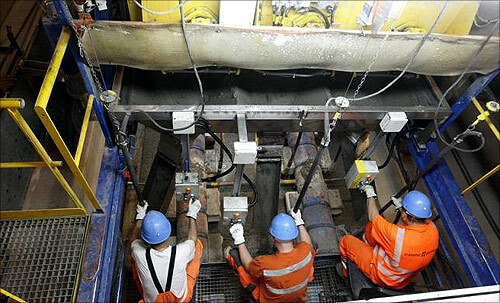 Workers use torque wrenches to fix screw nuts during the installation of the railway tracks in the NEAT Gotthard Base tunnel near Erstfeld May 7, 2012. 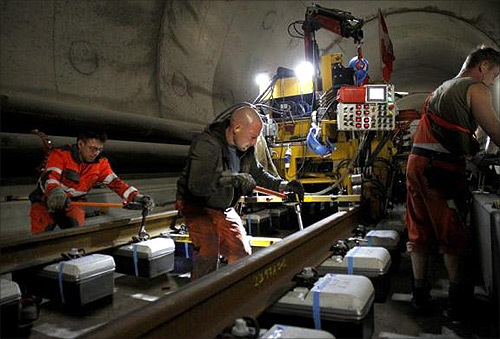 A worker adjusts a laser measuring gauge during the installation of the railway tracks in the NEAT Gotthard Base tunnel near Erstfeld May 7, 2012. 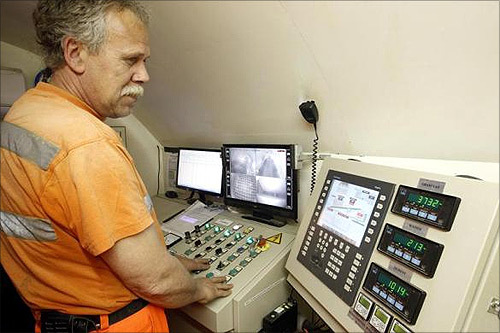 An employee looks at monitors to control the mixture of concrete on the special train 'Helvetia' in the NEAT Gotthard Base tunnel near Erstfeld May 7, 2012. 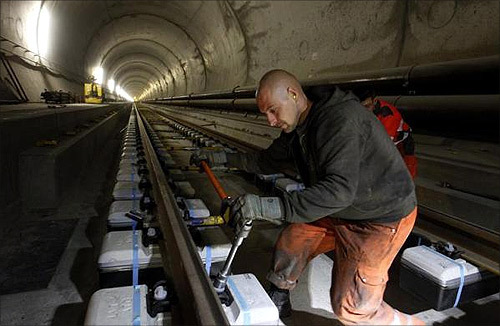 A worker prepares tools and material during the installation of the railway tracks in the NEAT Gotthard Base tunnel near Erstfeld.